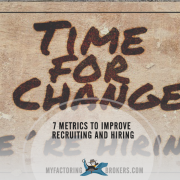 The recruiting and staffing landscape has never been more competitive. 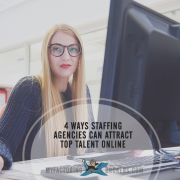 Agencies that want to land the best candidates need to stand out from the rest; these three innovative recruiting ideas for staffing agencies can help. You aren’t likely to come across a job posting from a company or a staffing agency that says “ho-hum candidates wanted.” Without an innovative approach, however, your staffing agency runs the risk of looking just like all the rest, and that “rest” is growing quickly. Well over one third of the members of the Staffing Industry Analysts Executive Forum indicated they believe the industry will grow from about $120 billion in 2016 to exceed $190 billion over the next 10 years. Those are some big dollar amounts, and you might be concerned that your agency will have to spend a lot of money on advertising or gimmicks in order to become more successful at attracting top candidates. 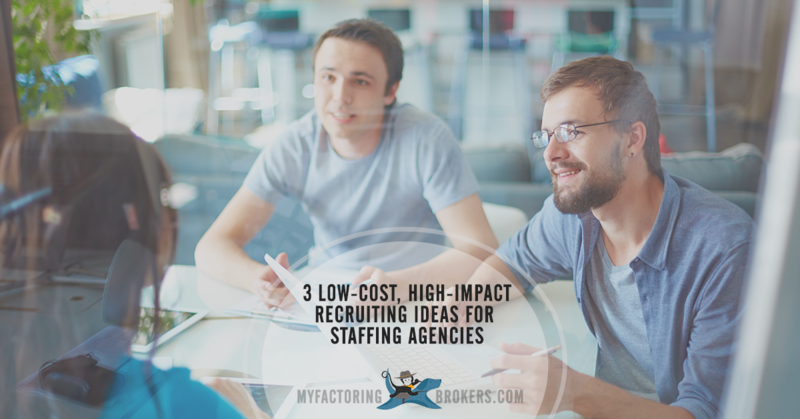 However, these innovative recruiting ideas for staffing agencies can help set your services apart, and they don’t have to break the bank to deliver a big return on investment. Today’s technology makes it easy for everyone to see information all the time, but at the same time makes swiping information and updates away or deleting information from an inbox equally easy and immediate. Within seconds, people decide whether to read an update, comment or click on an image. Sites like LinkedIn make it possible for prospective candidates to find and connect with company and agency recruiters instantly; indeed, it’s not uncommon to see updates about position openings throughout the news feed on LinkedIn and other social platforms. 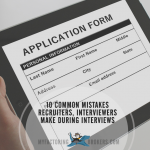 All of these voices have power, especially when updates come from people a prospective candidate knows personally, or when a “real employee” lends their voice to the recruiting effort by sharing a job post or positive reviews about what it’s like to work for their employer. 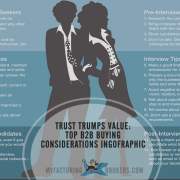 When information comes from a reputable voice a candidate will be more likely to click on the content, which then takes them to a company’s job posting or career site. The power of a voice – a real employee’s esteem for the organization they call home, can play a critical role in helping to engage and attract top talent to impact the future of the company. For every job opening there is an employer, title, description and salary. While all of these can get the attention of talented candidates, it’s the culture of the organization, the growth opportunities for an employee, the neighborhoods where they might live or work, and the added perks that make life a little bit sweeter that truly engage. Many companies recognize this is an advantage to gaining top talent, and so seek to engage candidates using short funny or inspirational videos in order to give prospective hires a peek behind the curtain. Although professional video production can be expensive, the cost to make your own short videos runs the gamut from free (using a cell phone, webcam or owned equipment) on up. Amazon has released many videos that give candidates insights as what it’s like to be a part of the culture and what they to expect working at Amazon on a daily basis, such as this one titled What is it like to work at Amazon: Go Beyond the Badge with Janna. This video was published in May of 2015 and since then has garnered nearly 16,000 views. 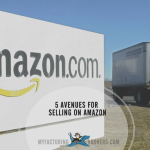 Another Amazon example is a video we have embedded below that talks about Seattle, where the company is headquartered, focusing on the e-commerce giant’s relocation package and why Seattle is a great place to live. A “prove it test” is any type of test a recruiter might use to determine whether an applicant has the skills needed to succeed in a given role. When you combine the idea of a prove it test with a personal challenge, you create intrigue that can motivate ambitious, talented candidates to take action. Think of this as one of the few times “if you build it, they will come” might actually work. In one example, when Google was recruiting engineers in 2004 they put up billboards that simply had a white background with an algorithm listed. Those who responded on their website with the correct equation and then succeeded in additional problem solving online were then redirected to a final recruiting page. Giving proof to the message displayed to those who reached the final recruiting page that “One thing we learned while building Google is that it’s easier to find what you’re looking for if it comes looking for you,” Google continues to use unconventional recruiting techniques in order to attract the uniquely talented employees they are looking for. In another instance, the MGM hotel in Vegas put together their own version of the reality show Iron Chef to test the mettle of applicants for a top chef job at one of their best restaurants (MGM and Iron Chef Contest). We offer staffing agency factoring services and staffing payroll factoring with low fees – as low as 1% – plus free same day funding, with advances as high as 98%. Get a free, no-obligation quote to compare against your current factoring program or find out how our staffing agency factoring or payroll funding could help you grow your agency more quickly.